Stroke is something most people associate with elderly relatives, so it may come as a shock that children can have them too. Strokes do occur in newborns and children, but fortunately, overall, the risk is low (less than 1 percent of children). Cardiac (heart) disease and sickle cell anemia (hemoglobin SS or sickle beta zero thalassemia) are the most common causes of stroke in childhood. Without proper screening, eleven percent of children with sickle cell anemia will experience a stroke by 20 years of age. 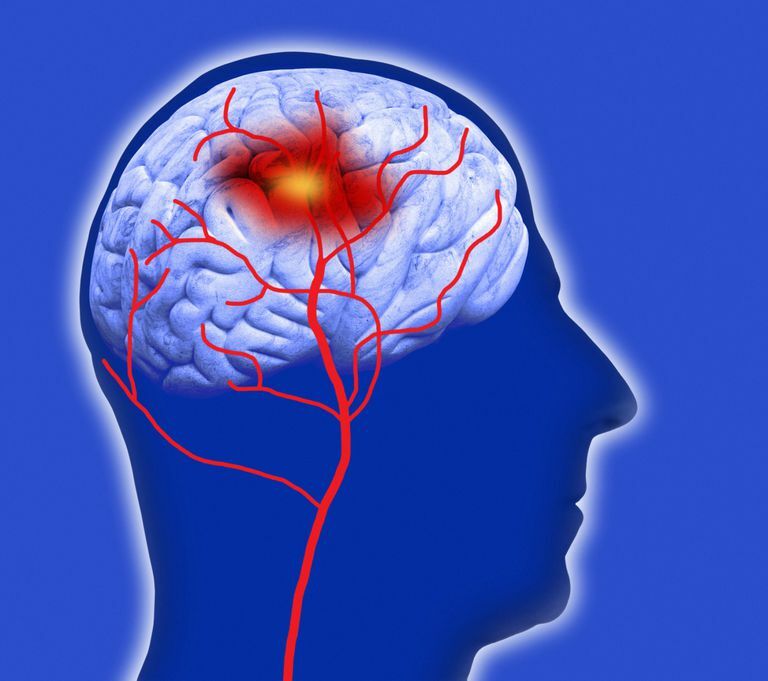 Approximately one in four patients will have a stroke by age 45. Hearing this sort of news about your young child can be shocking, but with proper screening, this risk can be reduced significantly. Why Are People With Sickle Cell Anemia at Risk for Stroke? The majority of children with sickle cell anemia experience ischemic stroke, meaning that blood flow cannot get to one area of the brain. Sickle cells damage the lining of the large arteries (blood vessels carrying oxygen to the tissues) of the brain, causing them to become more narrow. These narrow blood vessels are more likely to be blocked by a clump of sickle cells. When this occurs, blood flow is blocked and oxygen cannot be delivered to a specific area of the brain, causing damage. What Should I Do if I Think Someone Is Experiencing a Stroke? Call 911. Stroke, regardless of the cause, is a medical emergency. Early treatment is key to preventing long-term complications. The risk for ischemic stroke is highest for children under ten years of age. This risk decreases until around age 30, then the risk increases again. The risk of hemorrhagic strokes (strokes caused by bleeding) is highest in teenagers and young adults. The risk of stroke is highest in patients with hemoglobin SS and sickle beta zero thalassemia. The risk in patients with hemoglobin SC and sickle beta plus thalassemia (particularly in young children) is significantly less, so screening is not recommended in these patients unless there are additional concerns. In the late 1980s and early 1990s, researchers determined that transcranial doppler (TCD) could be used to screen patients with sickle cell anemia to determine the risk of ischemic stroke. TCD is a non-invasive ultrasound used to measure the flow of blood through the major arteries of the brain. To do this, the ultrasound probe is placed on the temples where the skull bone is thinner, allowing the technician to measure the speed of the blood flow. Based on these values, TCDs can be labeled as normal, conditional, and abnormal. Although children with conditional TCD values are at slightly higher risk of having a stroke, those with abnormal TCD are at highest risk and should be placed on a preventative treatment plan. Although the TCD seems like a simple test, it is not as easy as it sounds. There are many factors that can affect measurements during TCD. Fever and illnesses temporarily elevate TCD values. Conversely, blood transfusions temporarily lower TCD values. Essentially, your child should be at their baseline health when the TCD is performed. Sleep also affects blood flow to the brain so sedation (giving medications to help the patient relax/sleep during the procedure) or sleeping during the exam is not recommended. Young children might find it difficult to cooperate and be still, but parents can help by playing a movie or reading books during the procedure. How Good Is TCD at Identifying Patients at Risk for Stroke? Identification of abnormal TCD followed by prompt initiation of treatment has reduced the risk of stroke in children with sickle cell anemia from 11 percent to 1 percent. Not all children with abnormal TCDs would go on to have a stroke without treatment, but because stroke can have serious long-term consequences, all patients are treated the same. How Are Strokes Prevented if the TCD Is Abnormal? If your child with sickle cell anemia has an abnormal TCD, it is recommended that the TCD be repeated in one to two weeks. If again the TCD is abnormal, it is recommended that he/she be started on a chronic transfusion program. The STOP-1 clinical study showed that the initiation of a chronic transfusion program greatly reduced the risk of stroke. Chronic transfusion therapy consists of getting blood transfusions every three to four weeks. The goal of transfusions is to bring the hemoglobin S percentage down from more than 95 percent to less than 30 percent, to reduce the risk of sickle cells blocking the flow of blood in the arteries of the brain. Will My Child Always Need to Be on Chronic Transfusions? Maybe not. In a recent multi-institutional trial named TWiTCH, specific patients (based on things such as hemoglobin S levels, imaging of the brain, TCD values that went back to normal) were able to be transitioned from chronic transfusion therapy to hydroxyurea therapy. These patients were slowly weaned off transfusions as the hydroxyurea treatment was slowly increased. Patients with significant changes in the blood vessels in the brain may require chronic transfusion therapy long-term, similar to patients who have had a stroke.